We see it in the sky, but can’t climb aboard. The International Space Station is home to a small number of elite astronauts, working on cool experiments in a gravity-free environment. 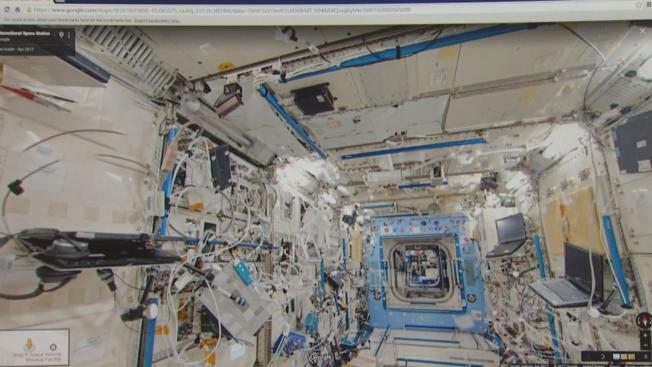 But now, thanks to Google’s Street View, you too can take a ride inside the ISS. Street View has, for the time being, ditched the cars and backpacks in favor of a small camera and bungie cords. The International Space Station is home to a small number of elite astronauts, working on cool experiments in a gravity-free environment. But now, thanks to Google’s Street View, you too can take a ride inside the ISS. Scott Budman reports. That’s Google’s Deanna Yick on how the astronaut on the ISS contorted himself to take more than 1,500 pictures Google eventually stitched together. The result is a cool tour of every nook and cranny of ISS. You control it with your mouse. A chance to search, in space, from Earth’s biggest search engine.